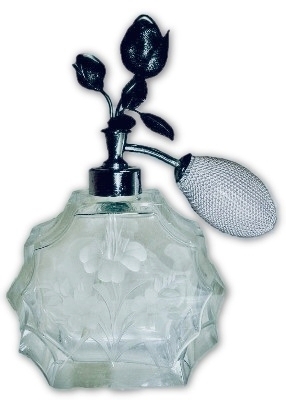 Bohemian cased art glass vase with silver mica inclusions. A nice Victorian era item with the original shear top and ground and polished pontil intact. There are a myriad of tiny bubbles between the exterior clear glass layer and the shaded butterscotch layer of glass then ultimately a thick opaque white glass interior. Measures 3 3/4" X 4". There is one tiny pin prick sized spot that may be simply a bubble that is close to the surface or the smallest bruise possible. 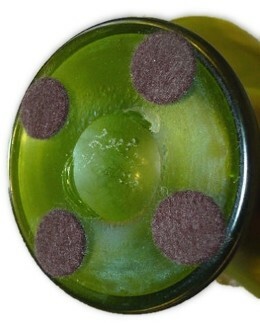 The bubbles between the layers is an intentional decorative technique. No chips, cracks or repairs. Bohemian semi opaque clambroth glass base/vase with hand painted flora and fauna. 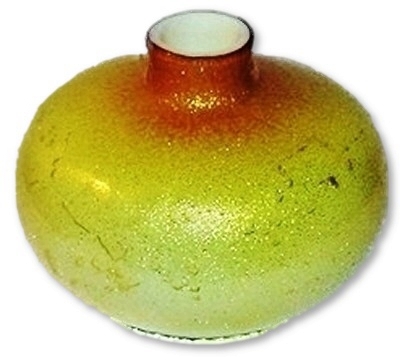 The top of this item has an original shear cut and we are not positive if this is the base for a flower frog vase, which may have had a mesh metal frog top or the base to a powder jar. Measures 4 1/4" across at the widest point and sits 3" tall. Unsigned but clearly an early bohemian glass product. No chips, cracks or repairs. 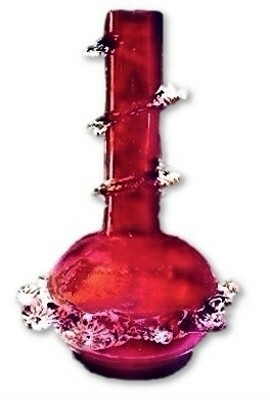 Early bohemian cranberry glass vase with applied crystal decoration. Shear cut top and no pontil. Measures 6 3/4" high X 4 1/2" across at the widest point. 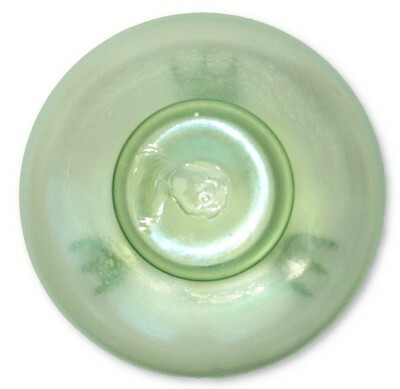 There are closed interior glass bubbles and a chip to one of the applied crystal daisies and a tiny bit of sharpness where the applied crystal tails off. No other chips, cracks or repairs. 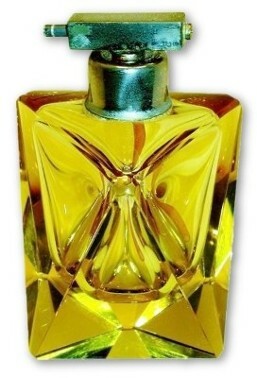 Vintage marked *MADE IN CZECHOSLOVAKIA* (in and oval) art deco cut crystal and yellow perfume bottle and original stopper. 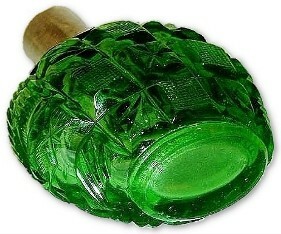 The bottom of this beautiful perfume is acid stamped Made In Czechoslovakia and retains remnants of its original paper foil sticker as well. The dauber is no longer present. 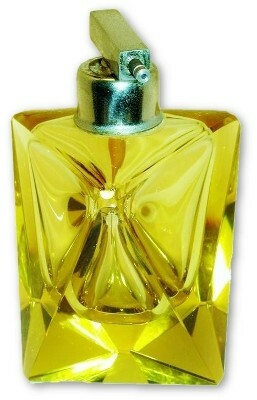 The stunning yellow floral stopper is incised in a 3-D pattern while the cut crystal base is in geometric design. Standing 6 1/8" high X 2 3/4" X 2 1/4". Other than the loss of the dauber, there are no chips, cracks or repairs to this item. 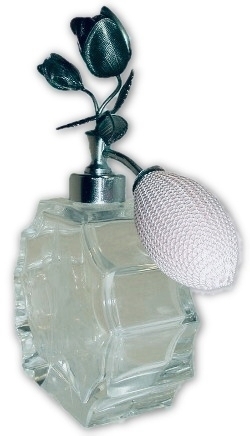 We do have the dauber which is no longer attached to the stopper and will include it with the perfume bottle and you may wish to have this item professionally reattached. 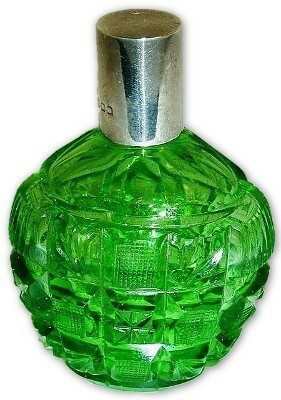 Vintage Czechoslovakian ovoid cut glass green perfume bottle. 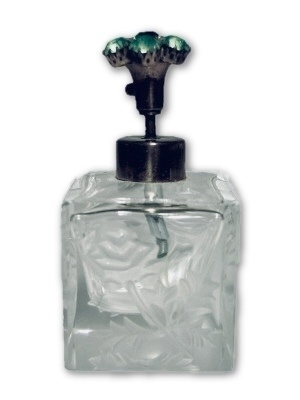 Bottle has its original screw on EPNS and three hallmarked top. Measures 3" X 2 2/8" X 1 3/8". Other than an extremely tiny in the making grinding flake on the base there are no chips, cracks or repairs. 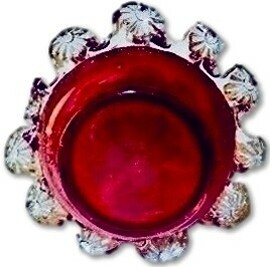 "ACID CUT BACK CAMEO GLASS"
Carl Goldberg, Haida, Austria circa 1900 Art Nouveau design of an acid cut back cameo glass technique embellished with silver fumed overlay. 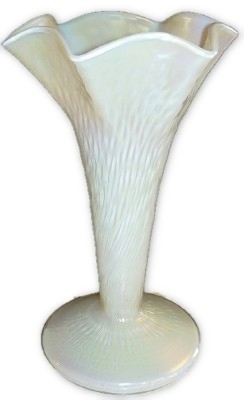 An elaborate Peacock Tail design on an iridescent textured yellow glass and unsigned and guaranteed to be as represented. Very light wear to the silver fuming. Measures. No chips, cracks or repairs. 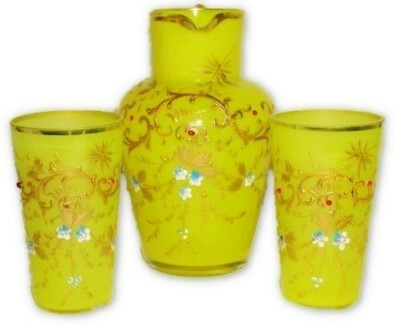 GRAF HARRACH LEMON GLASS pitcher and matching pair of jewel decorated tumblers. 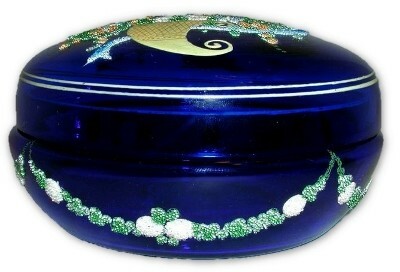 Decorated with much floral of gold, blue, and white. 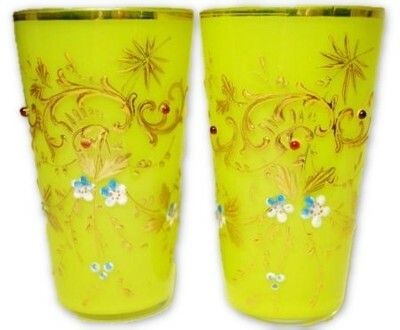 Matched pair of tumblers measure 4 3/4" tall and 2 1/4" across, (note one bead is partially missing but is not easily seen as so and is on the tumbler to the left). 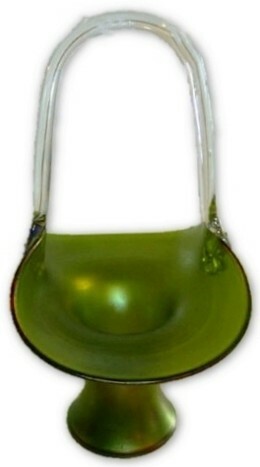 The base of the pitcher has a ground round pontil. The gold edges and handle have some wear. The pitcher measures 5 3/4" tall and 4" across. Glows a deep orange under black light. No chips, cracks or repairs. 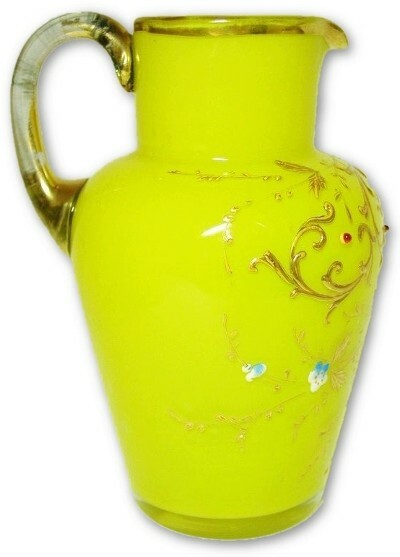 GRAF HARRACH MARMORIETES VARIEGATED LEMON GLASS vase with enamel decoration and the words "Fum Andenken" which translates "for souvenirs". Measures 6" tall and is an original cut from the top shear top. There is a small bruise within the glass on the rim which looks as if someone had attempted to buff it out. Normal gold loss and enamel wear. 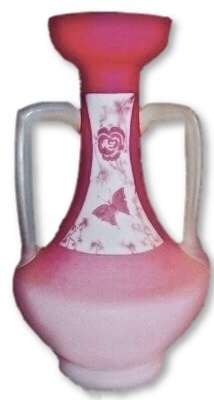 GRAF HARRACH gloss pink to white cased vase. Stands about 9 3/4" in height and is 4 1/2" in diameter. There is a small color darkened area between the layers of the neck. No chips cracks or repairs other than some minor in the making shear top flakes that occur when the item was created. "SATIN CAMEO GLASS PINK TO WHITE"
Graf Harrach satin cameo glass pink to cased white vase. Engraved on the side of the vase is the letters which appear to be GH or GR. Stands 10" tall and 3 1/8" across the top. No chips, cracks or repairs. GRAF HARRACH satin glass vase shading from deep raspberry down to soft pink/white, cased over a white opaque interior. The vase is an original shear top as there is no pontil on the base. The top rim has much of its original gold enamel. Stands 10 1/2" tall and measures 4 3/4" across at its widest point. There is a couple of extremely tiny flecks to the surface but are hard to see. No chips, cracks or repairs. 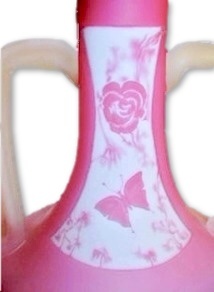 GRAF HARRACH pink to white satin glass corset vase. Shades from very rich raspberry down to the palest pink on the bottom possible. 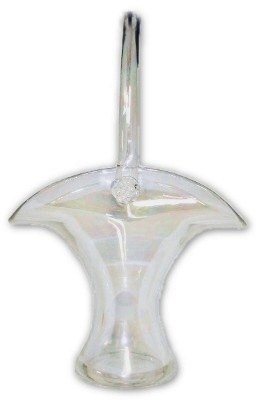 Lined in semi opaque white glass, it has a few small bubbles/tool marks. Stands 8 1/4" tall and measures 4 1/8" across at the widest point. No chips, cracks or repairs. 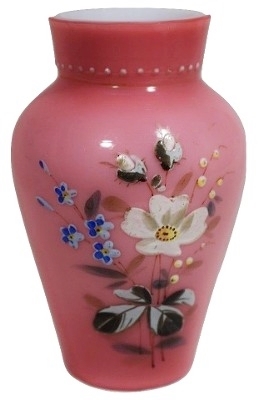 Pink glass cased over white glass and hand painted floral enamel decorated vase. 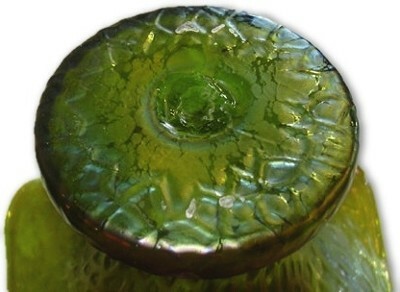 Measures 4 1/4" high and has its original shear cut top and a small swirl of dark glass on the bottom where a pontil would have been on the inner layer of glass. There is a little wear on one of the tiny collar dots. No chips, cracks or repairs. 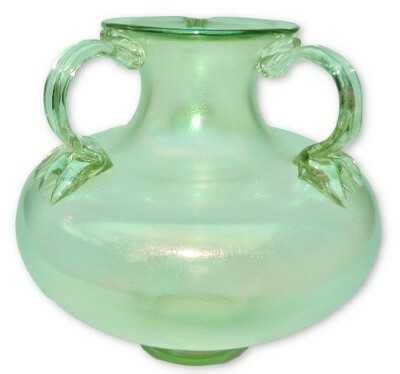 FRITZ HECKERT CYPREN, iridescent transparent green uranium glass vase. Three applied handles with ends intact. Measures 7" X 6 1/2". Glows bright green when under black light. Unfinished snap pontil with associated flat flake to the glass where the rod was removed. 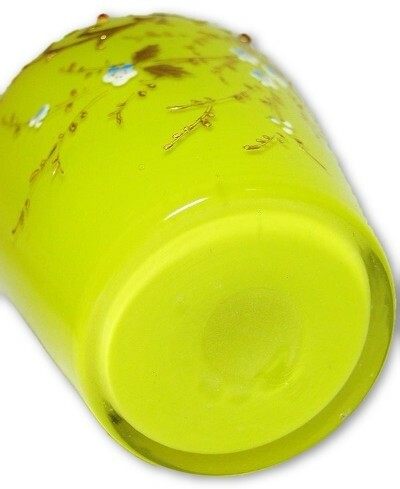 There is a small dip to the top rim from the creation of this vase where one of the handles is applied. No chips, cracks or repairs. Two antique Czeckoslovakian figural "FISH" hot glass miniatures. Each measure 1" X 7/16" X 7/16". 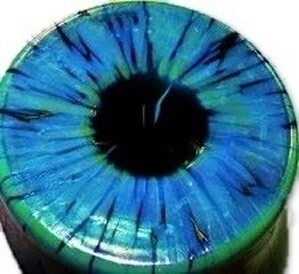 Made of free form shaped yellow glass, white iris's on both sides and a blue pupil. No chips, cracks or repairs. Antique Czechoslovakian hot glass "FROG" miniature figure. Measures 1 1/4" X 5/8" X 1/4". 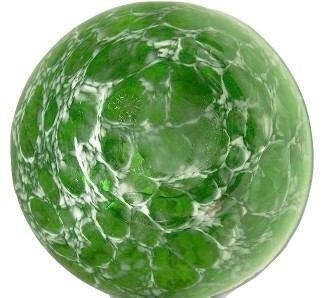 Green free form glass body with black dot glass eyes. No chips, cracks or repairs. Antique Czechoslovakian Hot Glass "3 ELEPHANT FAMILY" figures. 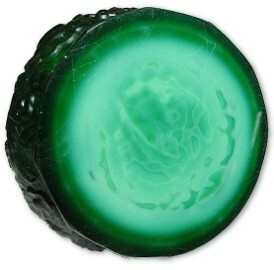 Each is of Jade Green glass and have black dot glass eyes. Sizes range from 1 5/8" to 1 1/2". No chips, cracks or repairs. Antique Czechoslovakian Hot Glass "3 ELEPHANT FAMILY" figures. 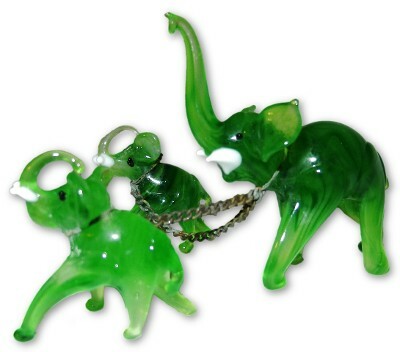 Each is of Jade Green glass, have white tusks and have black dot glass eyes. The original metal chain keeps the family together. Sizes range from 1 1/4" to 1 3/4". No chips, cracks or repairs. 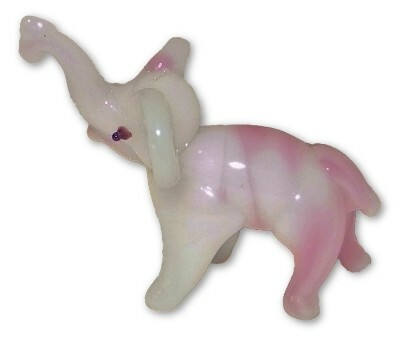 Antique Czechoslovakian Hot Glass "ELEPHANT" figure. Pink and white swirled glass and has purple glass eyes. Measures 1 1/2" X 1 1/2". No chips, cracks or repairs. Antique Czechoslovakian hot glass "SEAL" miniature figure. Measures 1 3/4" X 1" X 5/8". Mottled purple/grey free form glass body, orange flipppers, black whiskers, white iris and black dot glass eyes. No chips, cracks or repairs. Wonderful tiny Antique Hot Glass hollow Green and Orange Turtle miniature. Retains it's original MADE IN CZECHO SLOVAKIA round paper label. Measures only about 1". Very delicate and light as a feather. No chips, cracks or repairs. 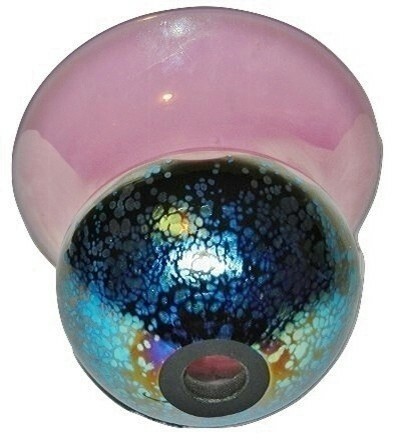 Kralik "Bubble Glass" iridescent finish over clear handled basket. Measures 10 1/2" X 6 3/4" X 4 1/2". 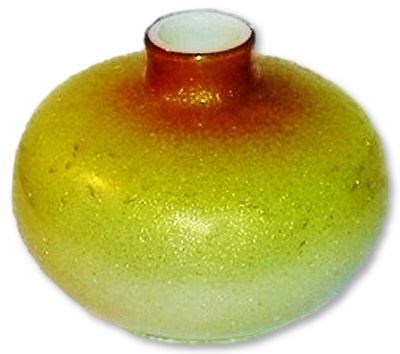 The base has a 1 1/8" ground and polished pontil. The handles have berry prunts where the applied handle attaches to the body of the basket. No chips, cracks or repairs. 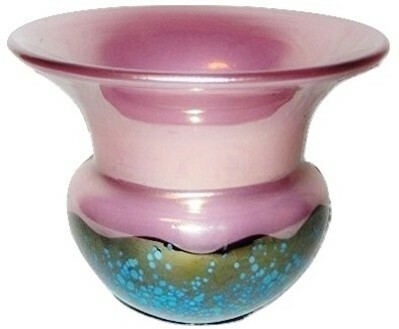 KRALIK iridescent glass vase! The vase has its original factory shear cut top. 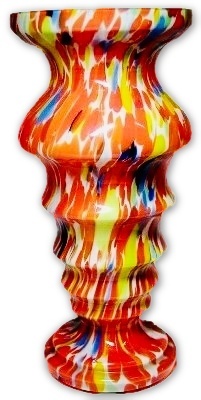 The vase stands a whopping 10 1/4" tall and measures 4 3/4" across at the widest point. 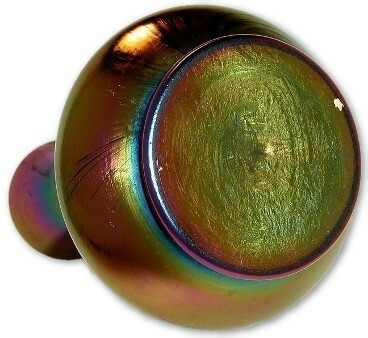 A very fluid shiny iridescence that will stun yours eyes upon viewing it and some unusual darker streaking to the finish as seen at the upper section of the item. No chips, cracks or repairs (a few minuscule orig shear top flea bites and a little uneven iridescent finish). 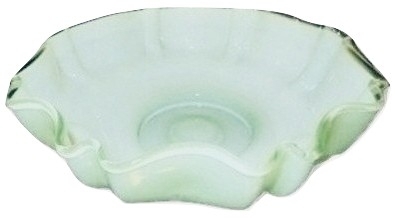 KRALIK CZECHO SLOVAKIA acid stamp & paper label marked mint green cased glass crimped edge bowl. This item has a small raised foot which has a ground and polished pontil. The base is twice marked; first with the Kralik block letter CZECHO above SLOVAKIA acid stamp while the items original oval paper label which reads Made in Czechoslovakia is being held with a very old piece of scotch tape (slightly yellowed). No chips, cracks or repairs. 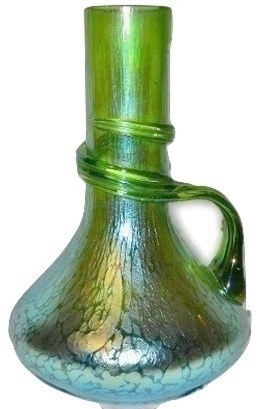 Antique KRALIK MARTELE' design green iridescent vase. 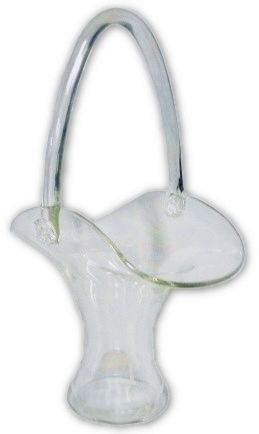 This beautiful corset shaped and ruffled rim vase has a snap pontil. Measures 4 3/4" X 3 1/2". No chips, cracks or repairs. Marked straight line "CZECHOSLOVAKIA" KRALIK black enameled on cased red vase. This item is an original shear cut top. Dates to circa 1912-1925. 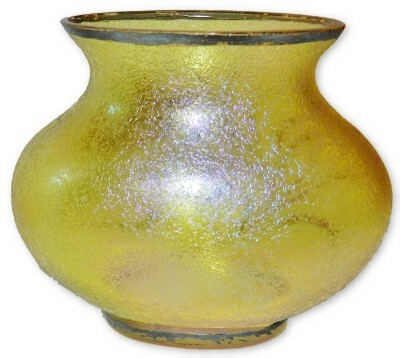 The vase measures 6 1/2" tall and 3" across at the widest point. No chips, cracks wear or repairs. KRALIK Mother of Pearl MARTELE' vase. Stands 8 1/2" tall and 5 1/2" across the widest area of the top rim. The base has a ground and polished pontil. No chips, cracks or repairs. 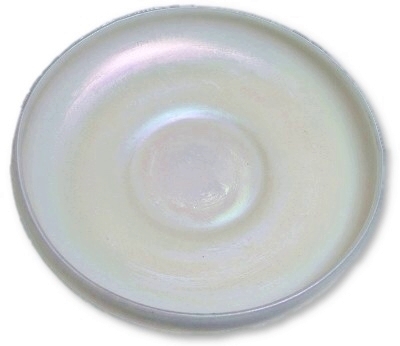 KRALIK Mother of Pearl glass bowl. The bun foot is factory ground flat. Measures 9 3/4" across and stands a total of 2 1/2" high. There are some small black flecks in the finish along a small section of the edge which are from the manufacturing process. No chips, cracks or repairs. 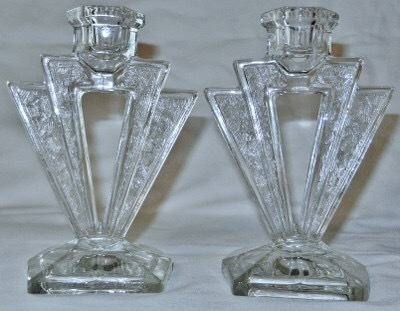 ART DECO CRYSTAL CANDLE HOLDERS "TCHECOSLOVAQUIE"
Art Deco mold decorated crystal candleholders with a molded mark "TCHECOSLOVAQUIE" Each holder stands 6" tall and 4 1/4" across at the widest point. No chips, cracks or repairs. 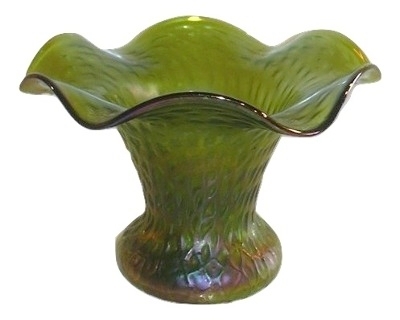 LOETZ AUSFUEHRUNGEN AUSF 226 art glass item, possible "shade" circa 1925. This item measures 3 1/2" X 4 5/8" with a 1 3/4" on opening. We purchased this item decades ago from an old, established family estate in Connecticut. 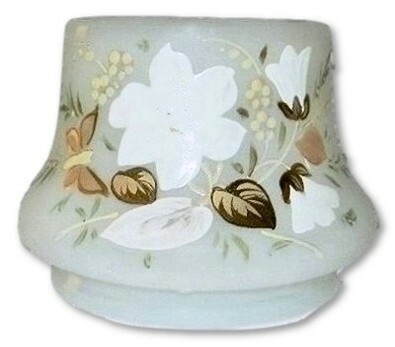 When we purchased this item, it was mounted on a period goose neck form lamp base. We still own the lamp base but the original socket is in very rough condition as often occurs with old lamps. The lamp base has what appears to be old, period, and very possibly original mounting hardware as well. 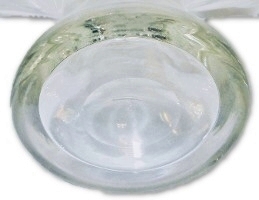 There is a small cap that fit over the ground section, which also had at one time a small felt like washer to protect the glass from the metal. On the interior attachment, the goose neck wiring arm goes through the ground opening in the glass, on the end there is threading where a nut/like washer device screws down against the glass on the interior of this item which also had a small disintegrating felt washer. At the end of the threading is a non operational small candle bulb size socket. The original cord has long since turned to broken bits of some sort of cloth covered rubber that encased the wires. This is basically gone at this time. 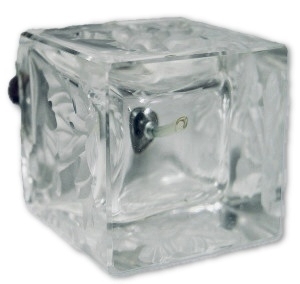 The plug was not a standard US style plug, but a European screw type plug. With all of this stated, we are not sure of what the origins of this item was intended to be. We have seen this shape but as the upper portion of a compote, yet the size of this item is smaller than that of the known and documented compote in the Ausf 226 glass. 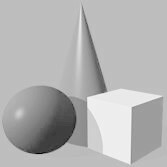 This item is smaller in all proportions from the few examples we have seen but we are not positive that this item started life as it is shown to be today. With this made clear we can make no claims to the origins of the shape as a shade or compote but we can guarantee that it is indeed LOETZ Ausf 226. No chips or cracks present. LOETZ "DIANA CISELE" applied handle ewer/vase. An original cut shear top example. Measures 6 1/4" tall and 3 3/4" across at the widest point. You can see a nearly identical example on the excellent website; "Loetz.com". 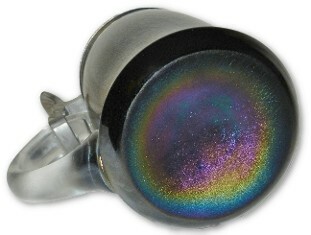 There is a tremendous amount of blue in the iridescent finish on this item. No chips, cracks or repairs. Signed "LOETZ" Austria BRONCE GLATT large handled basket. The applied handle has large floral prunts. 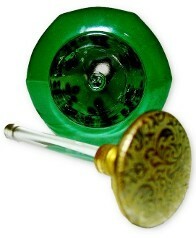 The soft yet very iridescent green finish is set off beautifully by the crystal applied glass handle. The basket is diamond etched on the polished pontil "LOETZ". Measures 10 1/4" X 6 1/2" X 4 3/4". No chips, cracks or repairs. 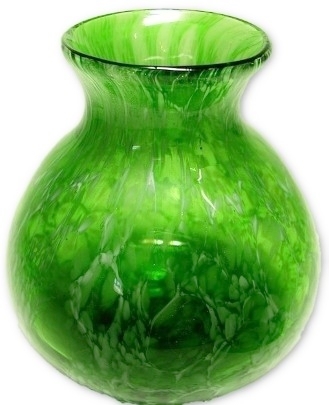 Loetz/Kralik green glass with blue iridescent finish vase. Has a ground and polished pontil. 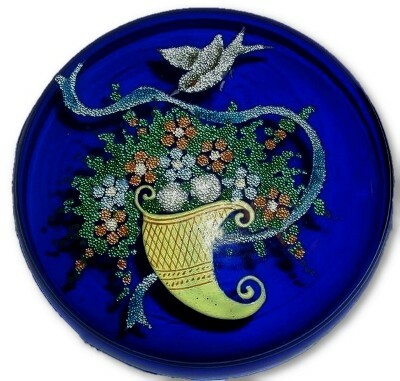 The vase measures 6 1/2" X 4 1/2" and a very unusual tooled top rim. There are no chips, cracks or repairs. 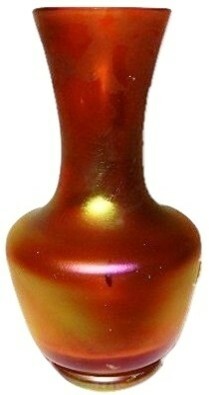 LOETZ GLATT VARIANT vase in an iridescent red/amber, original shear top and having a fully ground and polished base. Measures 4 1/4" tall. 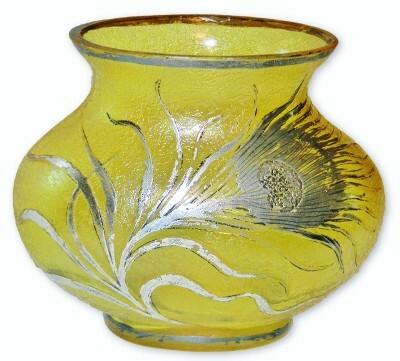 The finish shows signs of color blotching which suggest that the vase at one time may have had an enamel decoration or possibly a sterling overlay. There is a very small heat check mid body which we show in the very center of our image. 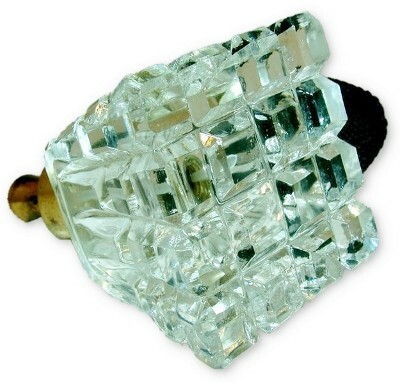 Beautiful topaz thick and heavy faceted crystal perfume atomizer! This item retains its original chrome finished hardware (some wear) and is waiting for you to put a new bulb on of your choice of color! This item measures 3 1/8" X 2 1/2". There are no marks but we are sure this item is Czechoslovakian and most likely by Moser from the first 1/3rd of the 20th century. No chips, cracks or repairs. 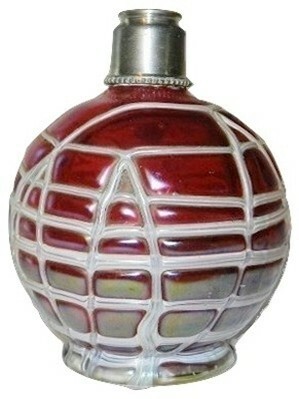 Pallme-König (Elizabethhütte) red and white thread decorated iridescent perfume atomizer base. Original hardware awaiting the addition of a new screw in top. Unsigned. Measures 4 1/2" X 2 1/2". No chips, cracks or repairs. 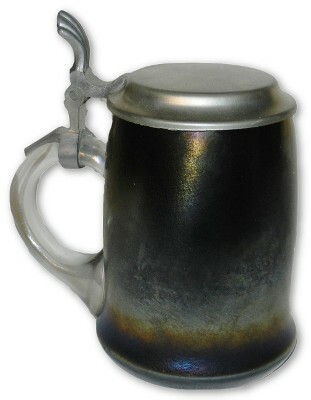 POSCHINGER (attributed) glass and pewter beer stein. Mugs main body of glass is so dark that it appears to be black, covered with a wonderful iridescent finish. 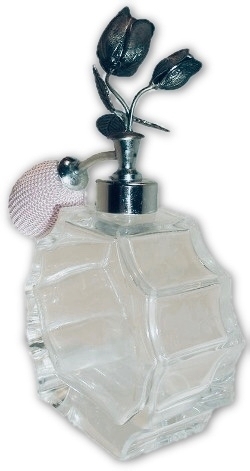 The hand applied satin finish handle has the attached pewter thumb rest and lid. No maker. Measures 6 1/4" X 4". No chips, cracks or repairs. 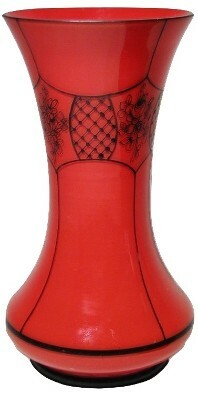 Red and blue iridescent trefoil top vase. Standing 6 1/2" high and flaring 4" wide across the top, this item retains its factory rolled edge rim and snap pontil on the underside of the base. No chips, cracks or repairs. 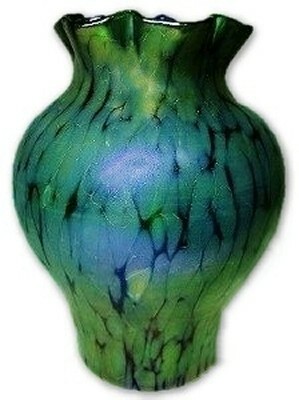 RINDSKOPF iridescent twist vase! Original shear top vase and has no pontil mark. The multiple layers of glass are line inside with such deep color that it is opaque. Standing 8 1/4" tall and measuring 3" across at the widest point. No chips, cracks or repairs. 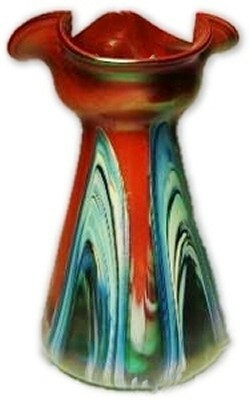 RUCKL CZECHOSLOVAKIA spatter art glass vase. 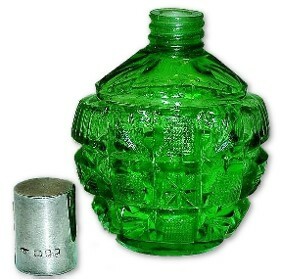 This item stands 8 1/2" tall and measures 4" across at the widest point. 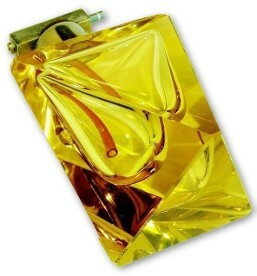 The highly unusual body shaped is enhanced by the 3 layered cased glass body. The interior layer of glass is of a semi opaque, opalescent, glass, then sandwiched between a crystal layer are confetti spattered colors in orange, red, white, blue, yellow, green, and black glass. A large acid stamped mark CZECHOSLOVAKIA. The base has a small hard to see flake of @1/16" and being shear top vase, there is some roughness from the making. No other chips, cracks or repairs. RUCKL CZECHOSLOVAKIA spatter art glass vase. Has an in the mold raised CZECHOSLOVAKIA on the base. 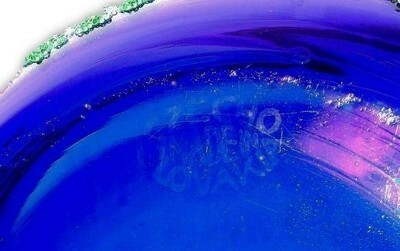 The exterior glass surface looks very similar to having had crayons melted and dripped over the interior cobalt blue glass. 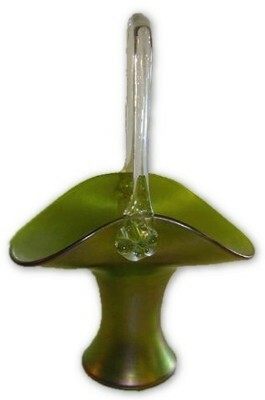 The vase stands 6 1/2" tall and measures 2 1/2" across the base. The top is its original shear cut finish with the most insignificant original grinding roughness from the manufacturing process. No chips, cracks or repairs. 1930'S. 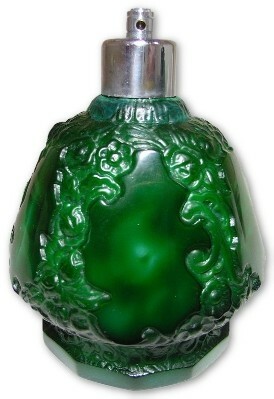 Schlevogt Ingrid dark Malachite glass perfume atomizer. Stands 5 1/2" tall and 4" across at the widest point. 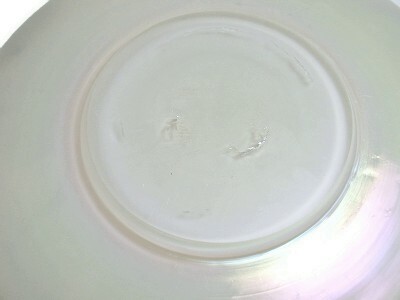 The base shows correct age wear and a few extremely minor flea bites to the faceted bottom edge. Needs a bulb and cord. 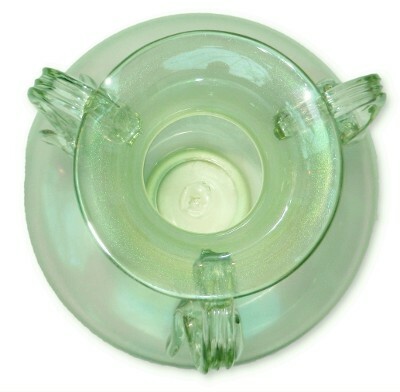 Retains its original glass draw tube. No chips, cracks or repairs. 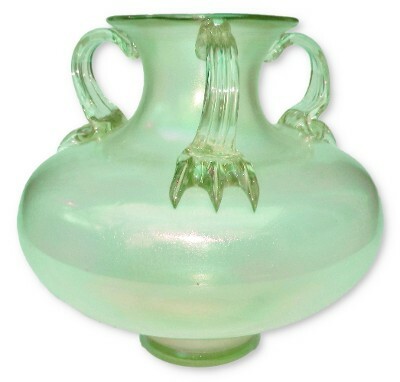 FRANZ WELZ (attributed) uranium glass thorn vase. 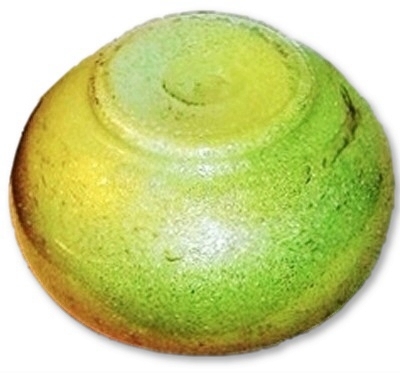 The stunning green to peach single thorn glows bright yellow when held to a black light. The tooled and crimped foot appears to have a small area of repair near to the annealed section of the vase and foot. 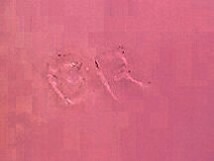 We have tried to figure out exactly what and why the repair is present but it was done so well that we can not determine what was actually done. The only reason we even became aware of the repair was when we checked the vase with our black light and a very small area showed slightly dull yellow. We must assume that this is a professional repair, it is an excellent job. The vase has a few of the thorns with minor chip/loss and the majority of the thorns are in excellent original condition. Stands 8 3/4" tall, 3 1/4" across the base and 1 3/4" across the top of the vase. Beautiful vintage white and green art glass vase. The technique of decoration is attributed to WMF Ikora and this may well be an example of their work. There is a nice ground and polished pontil on the base and fire polished top rim, again suggesting that this may be an WMF Ikora vase from the first third of the twentieth century. Measures 5 1/2" X 4 1/4". No chips, cracks or repairs.